With every single casino game, there is an optimal way to play that will help maximize your ability to walk away a winner. This even applies to video poker games, and if you’re going to be a winning jacks or better player, you need to remember a few key strategies. The following strategy is one that’s both easy to remember and simple to apply. Whether you’re going to be playing video poker in a casino or online, these things can bring about the best results. You should recognize some critical hands that might be attractive when they’re dealt to you. Good strategy says that you should exchange the cards in these hands in some way. A ten and ace of the same suit might look promising, but you should only keep the ace. If you are dealt three high cards not of the same suit, then you should keep only the two lowest of those high cards. If you have four low cards to a straight, and the card you need to make your straight is inside of your four cards, then you should discard everything. This will give you a good start, and other bits of strategy will sustain your approach. 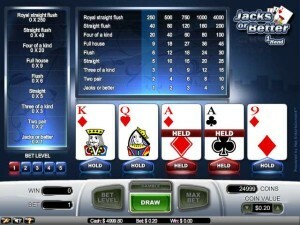 Jacks or better is a game where you should be chasing big hands whenever you have the chance. With most machines, the payout for your flush will make it worth your while against simply collecting pairs or three of a kinds. The way to win at video poker is by taking home a huge win whenever you get the chance. If you’re ever confronted with the choice of keeping hands that lead to a flush or a straight flush, you should opt for this approach versus keeping your small pair. The math says that this will lead to a better result over time. Too often, jacks or better players like to stockpile those high cards. You’re taught in most games that having high cards is good, and that’s true in this game if those cards are connected or suited. If you find yourself with a hand full of unsuited high cards that don’t connect, do not hesitate to exchange them. You should be looking for flushes, straights, and four of kind hands. Simply trying to nickel your way up with small pairs will leave you losing in this game.